BY PANOS PREVEDOUROS PHD – Cities rely on taxis to serve business people, tourists, the handicapped, the auto-less and people who cannot drive, and all those with urgent and important trips. Throughout the world, taxis are common carriers, which means that they serve everyone without preference or discrimination. They typically provide 24×7 service, and improve public safety by transporting intoxicated drivers home. Taxis provide essential intermodal connections at airports, harbors, rail and mass transit stations. The taxi is a privately owned and operated public transportation service. As an industry, taxis provide thousands of jobs in an urban area for drivers, dispatchers, managers and other vehicle-related jobs. A typical taxi “clocks” approximately 32,500 miles per year in Honolulu and close to 47,000 miles in New York City: A taxi vehicle is used roughly three times more than the average private vehicle in Honolulu and NYC. This in turn generates more business for others: Gas stations, service stations, car repair shops and auto sellers. And lots of fees and taxes paid to government at all levels. The taxi industry tends to be heavily regulated which may be tolerable during positive economic times but is burdensome during economic downturns and fuel crises. The cyclically revised tariffs per mile and minute do not take into account fluctuations either in the prices of vehicles and fuels or in the value of time. Other disadvantages of the taxi industry are the constant exposure to traffic congestion and traffic accident risk. Managing a fleet of hundreds of taxis over thousands of miles of a large city network is a daunting task. Done wrong, there can be tremendous waste of driver time and fuel on empty hauls, or long waits at the wrong location. This is where Intelligent Transportation Systems (ITS) come in with the combination of computerized optimization, automated vehicle location (AVL), global positioning systems (GPS), and fast mobile network based communications between fleet and dispatch center. Fuel savings and more revenue trips per shift pay for the technology and improve the taxi operator’s bottom line. With an integrated system, the right customer is paired with the right available taxi within seconds resulting in superior customer service and minimized down times and wasted fuel. On the aggregate, thousands of taxis (e.g., Honolulu has nearly 2,000) conducting optimal trips can save a lot of congestion and emissions for the whole city. Taxi is arguably the best mode for urban transportation and this is evidenced by its worldwide success. It is car-based so it is fast, convenient, private, clean, and provides door-to-door service. The customer is free to be productive during the trip, and at the end of the trip there is no need to look for and pay for parking. Indeed, taxi is one of the most basic modes of urban transportation which along with taxis include car, car-pool or van-pool, bus, walk, bicycle, moped or motorcycle, and telecommuting. Some cities have express bus service or bus rapid transit (BRT), light or heavy rail, jitneys, ferries, funiculars and other specialized modes. 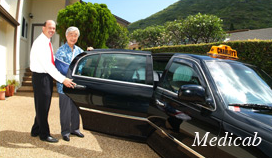 Taxi service is public transportation and is an essential mode of metropolitan transportation throughout the world. Could taxis solve the Ewa plains to town congestion problem on Oahu? This is only a half-serious question, but given how government wastes money, it’s worth looking into. Federal and local government wasted $6 Million on TheBoat. It carried roughly 300 people per day for about two (2) years. The same subsidy to 100 taxis would have carried the same people for 6.5 years.